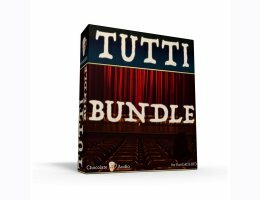 The Cinematic Bundle from Chocolate Audio is the complete collection of their superbly crafted virtual instruments and loop collections. Unusual Pianos you have been dreaming of having. Chocolate Audio already has four pianos in their product line, two of which are very sought-after top-notch models. They made the choice to release another stunning piano sample pack which was a difficult task to do, but it ended up being very rewarding in the end. When creating upright piano Instruments, it is very important deciding which upright piano to start from. When creating grand pianos, the choice is more limited, as there are fewer outstanding examples to chose from. Upright pianos are a totally different story, there are a multitude of choices. Chocolate Audio chose a piano capable of producing both a full sound and the on the edge of being slightly out-of-tune tones characteristic of so many historical recording of these types of pianos. They sampled a beautifully made italian upright piano built by Steinbach in Torino and placed it in a mid-size roomy studio surrounded by a plethora of microphones. Contemporary Vintage Drums features 3 full drum kits sampled from: - Ludwig "Beatles" tribute kit (drum sticks used), - Ludwig "Beatles" tribute kit (brushes used), - 1977 Gretsch Concert Rock kit (drum sticks used). The Black Album Drums is a drum library for BFD3 and Kontakt 5.5 (full version) inspired by the drum sound featured on the "Black Album" by Metallica from 1991. It features the kit played on that record, not just the same model, that exact kit (a 1980 Gretsch with Zildjian cymbals and a Tama Bell Brass snare). The BBassV Electric Bass comes after several years of R&D and Chocolate Audio has set a new benchmark in terms of playability and sound. This virtual instrument is derived from a Yamaha BB415 5-string electric bass, one of the few "non-classics" instruments because it has tons of character. The first release in The Choco-Matic Series features the sound of a one-of-a-kind wonder guitar: a Custom Shop ESP 8-string baritone guitar specially made for Gianluca Ferro. The Exclusive Choco-Matic Engine is not your common "play a phrase at a time" engine. Chocolate Audio built this engine making use of their expertise as sample library producers since 2003 and their knowledge as users of such phrase-based instruments. Gianluca Ferro is a very accomplished guitar player and does ESP endorsments. Having played in numerous international metal acts, knows quite a bit about the tone and attitude required to achieve perfectly tight and soulful tracks. The Exclusive Choco-Matic Engine is not your common "play a phrase at a time" engine. Chocolate Audio built this engine making use of their expertise as sample library producers since 2003 and their knowledge as users of such phrase-based instruments.